Stamps and Stitches: Here's to you, Dad! 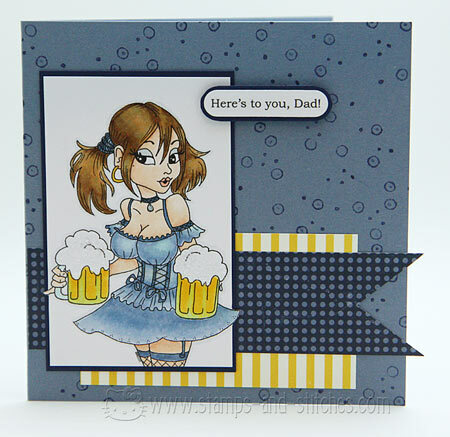 At first I wasn't sure if a pin-up girl card was appropriate for Father's Day. But then I figured with this sentiment, it works. Plus my dad has an amazing sense of humor and he loves to look at pin-up girls so why not? I used an older sketch from The Sweetest Thing sketch challenge blog. LOL! Very cute and very fun card! Oh I LOVE THIS!!! So cute and love the way your stripe paper matches the "brew"! Cute image and it's colored just great. Know your dad will love it - any guy would!!! Lol, I think it's humorous. Not inappropriate. You have such great coloring skills and this card is stunning! Great card - I bet he loved it! This is a fabulous card Gale! Love the background stamp you used. I think this is a fun card for Father's Day. What a cute card. I know my dad would have loved that for Father's Dad. And your coloring is fantastic!